Whoever said ?Rock is Dead!? obviously forgot to mention its demise to Johnny Lima. After hearing his new CD Livin' Out Loud, it's clear that Lima sure as hell didn't get the message. 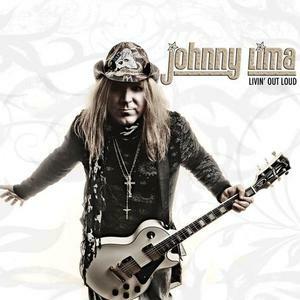 Johnny Lima is back with a new album called Livin' Out Loud, released May 4, 2009. The album showcases a more guitar-oriented approach than Lima's previous releases, or as one critic put it, ?12 stunning new songs! His new stuff sounds more dirty, catchier and rougher than everything else before. ?? Lima spent the last three years lending his production skills to artists like Dirty Penny, Miss Crazy, Diamond Lane and Freakshow (featuring Frankie Banali, Tony Franklin, Jeff LeBar and Markus Allen Christopher), but now he's doing what he does best -- and that's making melodic Rock 'N Roll like no one else. Born to Portuguese immigrants in a small town in central California, Lima got his first taste of Rock ?N Roll at the tender age of four, when his parents let him stay up late one night to catch KISS on a TV show. Little did they know that it was that one band, on that one TV show, that would convince their child that all he was meant to do in his life was to Rock ?N Roll All Night. After many years of ?playing? to his favorite KISS records with a tennis racket, his parents finally gave in and bought him his first guitar, eight years later at age 12. ?I was too impatient to ?learn' the guitar the proper way. I wanted to get down to writing songs the minute I picked up the guitar for the first time? said Lima. ?And I'm glad that was the approach I took. To this day, I still meet guitar players that blow me away with their technique, but they can't write a song to save their life. Writing songs is how you make money in this business -- not playing guitar solos.? A few years later, Lima took his acquired songwriting and vocal talents north to the San Francisco Bay Area in search of the ultimate rock band. After fronting a couple of popular local Bay Area bands, that didn't amount to much outside of the Bay, Johnny decided it was time to take it to the next level. By doing so, he'd have to do it alone. After spending a few years on his own honing his songwriting skills, Johnny entered the studio to record his debut solo album with money his parents gave him. In 1996 his debut album was independently released worldwide. A brave move, considering the musical climate had changed drastically and any rock music with hooks and melody was now out of fashion with the mainstream. However, it was an album that over 10 years later would command upwards of $80 on eBay since it was out of print only two years after its release. Although the music business wasn't kind to him in his own backyard, across the Atlantic, Lima's style of music was still respected and garnered the attention of many independent labels in Europe, those hell bent on keeping melodic rock alive. Lima's music caught the attention of Now and Then Productions in England, who signed him to a production deal in 1998. A year later, the follow-up to his debut album, Shine On, was released by Italy's Frontiers Records. The album earned rave reviews all over the world, including a perfect score in Scream Magazine (Norway) and Majestic Magazine (Holland). Lima was also invited to perform at the annual Gods of AOR show in England in 1999 and 2000. On his return from England in 2000, Johnny wasted no time and began writing music for his third album that was scheduled to be released in 2001. Little did he know that 2001 was going to be a very important year in his personal life, and that music would take a backseat for the first time. Lima married his longtime girlfriend Cara in 2001 and in December they welcomed the birth of their son, Ashton. Made in California wouldn't see the light of day until 2003. Released by Frontiers Records, Made in California was an album that showcased Lima's knack for big hooks, big vocals, and was the perfect soundtrack to any rock fan's summer. It was also the last album Lima would record for Now and Then Productions and Frontiers Records. During this time, Lima's debut album from 1996 was becoming a much sought after album amongst rock fans and therfore harder than ever to find. He decided to re-record the songs from the debut album, and release them so his fans wouldn't have to pay outrageous prices for the '96 debut album on eBay. Version 1.2 was released by Escape Music in 2005 and would include brand new versions of most of the songs on the debut album, with a new song added in for good measure. After the release of Version 1.2, Lima decided it was time for a break. His planned "break" from music was going to be short lived, because four guys with big hair from Santa Cruz, Calif. called on him to produce their debut album. Between 2006-2007, Lima kept himself busy in the studio producing and co-writing Dirty Penny's debut album Take It Sleezy, which reached 39 in Classic Rock Magazine's top 50 albums of 2008. He also produced an E.P. for Southern California's Diamond Lane. Finally, Lima was also called on to record and mix albums by Miss Crazy, and the highly anticipated debut album from the new supergroup Freakshow. Also during this time, Lima decided to do what everyone else was doing and join the social networking juggernaut MySpace. It was then that Lima realized his music's impact on people's lives. The hundreds of e-mails and comments he received made him realize that he wasn't ready to hang up the microphone just yet. ?It was a lot of fun and a great learning experience recording other artists. I had a blast, but it was time for me to get back in front of the microphone where I belong,? Lima said. So in the summer of 2008, armed with more than an album's worth of material, Lima went back into the same studio (Suspect Studios) that he's called his ?home away from home? for the last few years to record his follow up to 2005's Version 1.2. The new album titled Livin' Out Loud was released worldwide on May 4, 2009 independently. Everyone who has heard the new album has said that it's his best work to date. With a renewed passion for making music, Lima is planning on sticking around for a while longer, and is not content on having his music only listened to on an I-Pod or the in comfort of someone's home. Plans for live performances are in the works, and fans can rest assured that any live performance from Lima will be just as exciting and fun as his music. For over 10 years, rock fans could always rely on Lima to deliver good times and melodic, hard rockin' music, no matter what the flavor of the month was. Remember... if it rocks, and if it's catchy as hell, then it must be Johnny Lima. With Livin' Out Loud on the CD Baby, AOR Heaven and NEH Records top sellers lists for multiple weeks, Lima is proof that rock ain't dead. So let the critics and pundits say what they will about melodic Rock 'N Roll -- Lima is going to continue doing what he's doing regardless. Livin' Out Loud puts their criticisms to rest in every way.